We specialize in representing clients in the purchases, sales, and tax deferred exchanges of real estate property (residential, commercial, professional office, land, etc. ), vacation or long term rentals, and land use planning & development within the Adirondack Park Region (over six-million acres). We provide Portfolio & Property Management of your real estate inventory as well as, market and investment analyses (present value, future value, internal rate of return, etc. ), of current and potential real estate investments. Lana M. Gokey is a graduate from Cornell University with a BS in Landscape Architecture, and Masters' work in City & Regional Planning. Lana also has a BS from Empire State College in Business, Management and Economics. In the past Lana has worked as a Project Review Specialist for the Adirondack Park Agency, Administrator for the Elmira Economic Development Zone, Planner for the Sasaki Associates, Planner for the Tompkins' County and the Town of Ithaca's Planning Departments, as well as Landscape Designer for the Cornell University Real Estate Department. 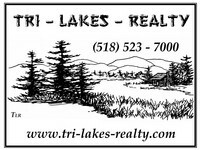 Specializing in Residential, Commercial and Land Sales, Vacation Rental Property,Long Term Rental Property, Land-use Development, Real Estate Investments, Portfolio and Property Management to buyers and sellers in the Tri-Lakes (Lake Placid, Saranac Lake, Tupper Lake), Keene, Keene Valley, Jay, Wilmington and Adirondack Park Regions of New York.